-SGX Nifty is indicating a marginally negative opening for the Indian markets ahead of weekly expiry. -Nifty finds support around 10750, while 10891 will act as resistance. Bank Nifty finds support around 26750 & finds resistance around 27108. -In yesterday's trading session, FIIs sold 676cr (cash), bought 397cr in Index Futures. -US markets gained; Asian trade cautiously amid ongoing US-China trade negotiations. US stocks rally another day as Nasdaq enters bull market, up 20% from recent December lows. Asian indices opened flat after seeing a superb week till now led by the US markets & positive momentum on US/China trade talks. -Rupee snaps 6-days gain, ends 10 paise down at 70.80/$. -RBI clears Yes Bank of divergence. -IndiGo to cancel 30 flights/day till March-end. -RBI penalises SBI, BoB, Union Bank of India, Corporation Bank for non-compliance of norms. -DHFL CEO Harshil Mehta resigns. -Axis Bank OFS subscribed 3.68 times on Day 2. -UBS initiated BUY on IEX, TP Rs215. -HSBC initiated BUY on Reliance Nippon, TP Rs217. 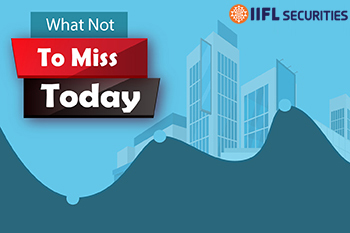 -Results today: ONGC, Ashok Leyland, Jet Airways (India), Indiabulls Real Estate, Glenmark Pharmaceuticals, Voltas, Shree Renuka Sugars, IFCI, Parsvnath Developers.